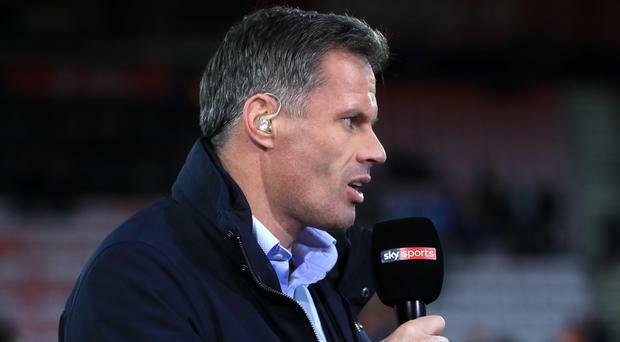 Jamie Carragher has apologised after video footage emerged of him spitting at two Manchester United fans following Liverpool's defeat at Old Trafford on Saturday. The Daily Mirror website has published a video that shows the Sky Sports pundit wind his car window down and spit at supporters who were goading him over his former club's defeat at the hands of their biggest rivals, Manchester United. At first, it appears Carragher is smiling at the United fans, reported to be a 14-year-old girl and her father, but then winds his window down and spits at their car. The young girl is then heard saying the spit had hit her. Carragher has issued an apology to the girl and her father. He told the Mirror: "It was a bit more than 'hiya Jamie, it was 2-1'. It went on for two or three times. I drove away at first and it just continued and continued. "I was leaving the ground and trying to keep my head down. I thought it was a Liverpool fan at first wanting an autograph at first so I stopped. It carried on and I drove away but it carried on again and I lost my head. "I shouldn't have done it but I was thinking what is a grown man doing, carrying on like that two or three times with his daughter in the car? I will apologise to the daughter." The Liverpool legend has now issued an apology on Twitter. Sky Sports has said it will hold talks with the pundit, who is due to appear on Sky's coverage of the Stoke v Manchester City game on Monday night. In a statement, Sky said: "It is unacceptable behaviour and we will be addressing it with Jamie."